The 2014 NYC Century Bike Tour will be on Sunday September 7th. There will be finish lines in both parks, but the official Finish Festival of the NYC Century Bike Tour is in Central Park. Escorted by T.A. marshals, this route is meant for first-time riders and families. Riders travel around historic Washington Square Park, roll through the hip scene in SoHo and then proceed over the Brooklyn Bridge. The tour officially finishes in Prospect Park, where riders can collect their t-shirts and water bottles. Additionally, the Prospect Park Zoo, and the Prospect Park Carousel will both offer free admission to anyone with a NYC Century Bike Tour ride bib! Just be sure to bring a bike lock to secure your bike. Route begins at 8 am in Central Park. Finish by 12 pm. You cannot start the tour in Prospect Park. This route is ideal for riders looking for more than a Sunday stroll. The route travels through historic Downtown Brooklyn, around idyllic Prospect Park, through the artistic enclave of Williamsburg and follows the East River all the way to Astoria Park in Queens. Route begins in Central Park at 7:30 am or in Prospect Park at 8 am. Finish between 11 am and 3 pm. This route increases the mileage, but with New York’s relatively flat terrain, it is a manageable route for a rider looking to challenge themselves. This route takes riders through waterfront views along the Brooklyn Greenway, including the majestic Verrazano Bridge and the famous amusements at Coney Island. The route eventually re-connects with the 35-mile route to the finish. Route begins in Central Park at 7 am or in Prospect Park at 7:30 am. Finish between 11 am and 4 pm. This route is not for amateurs. Riders travel out to Far Rockaway, Queens and beautiful Fort Tilden Beach. The route takes riders along miles of Queens greenway, through the serene, car-free Forest Park and up to Kissena Park, before cutting west through northern Queens to Astoria Park. Route begins in Central Park at 6:30 am or in Prospect Park at 7 am. Finish between 12 pm and 4 pm. The full 100 mile tour is for experienced bicyclists only. After Kissena Park, 100 mile riders split from the 75 mile route and swing through eastern Queens, along the waterfront on Little Neck Bay and under the Throgs Neck Bridge, before looping back west to Astoria Park. The route continues into the Bronx. This part of the ride is hilly and the most challenging. 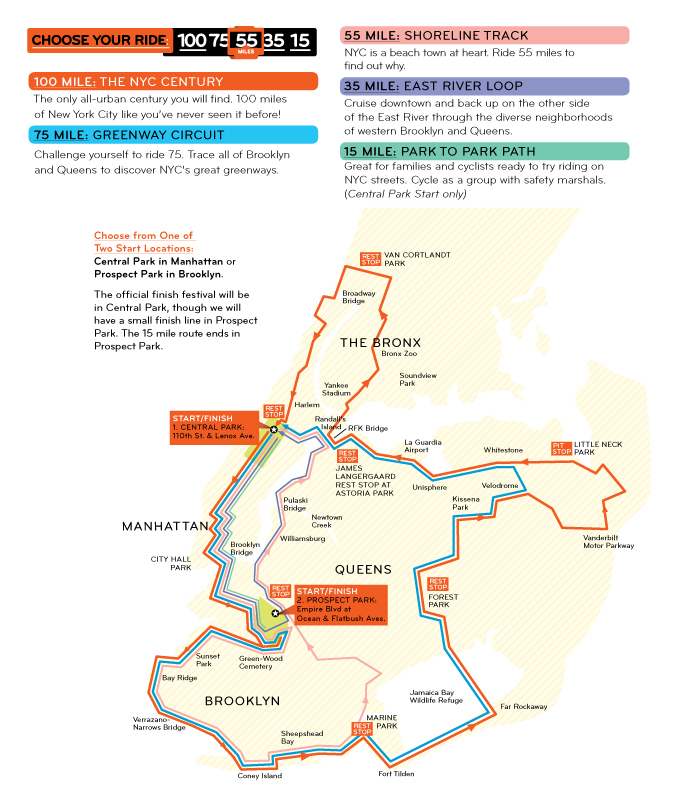 The route winds down through northern Manhattan and historic Harlem. Route begins in Central Park at 6 am or in Prospect Park at 6:30 am. Finish between 12 pm and 6 pm.